Eat! Drink! Game On! This WhirlyBall coupon is valid for one walk-in player when accompanied by 3 or more paying walk-in players to play a 30-minute game of WhirlyBall or laser tag session at no charge. WhirlyBall combines basketball, hockey, lacrosse, and bumper cars all rolled into one. 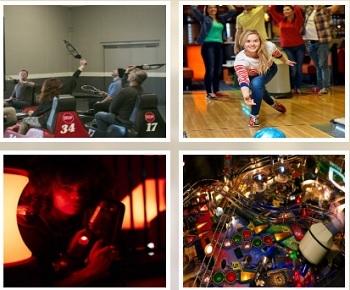 Whether you’re planning a Birthday Party, Corporate Meeting or Outing, Team Building Session, Bar/Bat Mitzvah, Bachelor/Bachelorette or Holiday Party, WhirlyBall is the most complete venue in Chicagoland that offers a variety of entertainment options including WhirlyBall, lasertag, video games, pool tables, indoor bags, a complete F&B menu, and 3 flexible event facilities that comfortably accommodate 10-500 guests. Our new Chicago location in Bucktown has everything you loved about the former WhirlyBall, but in a beautiful, new package – now with BOWLING, too! Visit our website for more information.